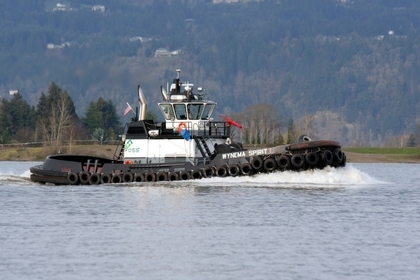 Built in 2000, by Diversified Marine Incorporated of Portland, Oregon (hull #12) as the Wynema Spirit for the Brusco Tug and Barge Company of Longview, Washington. In 2017, the tug was chartered by the Foss Maritime Company of Seattle, Washington. Where she retained her name. Powered by two, Tier III compliant, Detroit Diesel V12/4000 diesel enignes. Turning two, 80(in) propellers mounted in Ulstein z-drives, for a rated 3,600 horsepower. Her electrical service is provided by two, 99kW Northern Lights generator sets. The towing equipment consists of 50 horsepower, single drum, Markey DEPC-48, winch. Mounted on her bow.